It is not unusual for Del. Patrick McDonough, the populist conservative from Middle River, to be the lone rabble rouser on legislation. But Thursday morning’s display of confusion and upset stemmed from his belief that more and more bills this year are rewarding criminals with earlier releases or softer penalties. The bill that provoked this display of emotion Thursday morning was HB 388, which proposes the creation of a Justice Reinvestment Coordinating Council (JRCC). 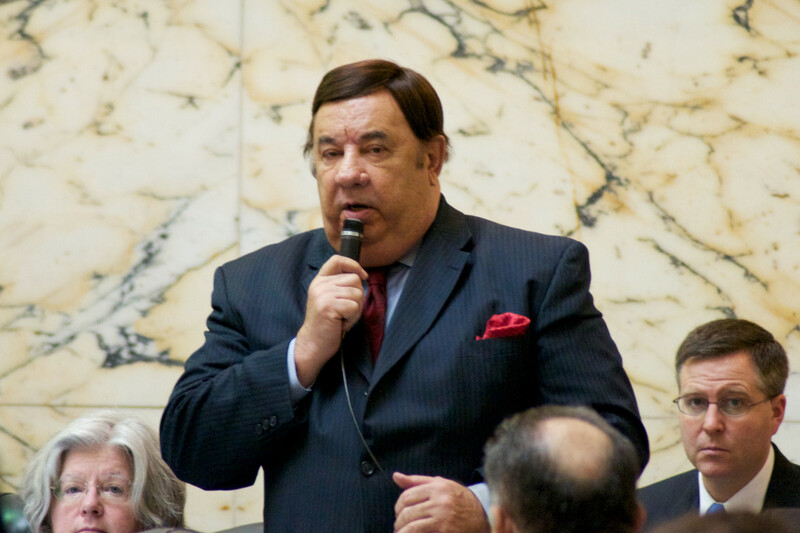 Despite resistance, two bills opposed vocally by McDonough Thursday received a majority vote on the House floor and will move onto the Senate. The Justice Reinvestment Coordinating Council passed 119 to 19, and a pilot program to help ex-offenders start a small business passed 97 to 41. The council would be placed in the Governor’s Office of Crime Control and Prevention, tasked with developing a statewide policy to save money by reducing recidivism and increasing public safety. “When you look at this bill it looks very tame and it looks like something we might want to consider… but you need to look at the bigger picture,” said McDonough. The delegate said the bill had the “false premise” of saving money, but what it really intended to do was create an “advocacy group for early release” of criminals. Gov. Larry Hogan, a Republican, spoke out in support of the HB 388 Thursday evening. McDonough worries that with a focus on reducing the number of criminals returning to jail, the state will be more lax on offenders in an effort to save money. Del. Kathleen Dumais, sponsor and vice-chair of the Judiciary Committee, argued that the council would not affect reincarceration of criminals, but was a task force to simply look at “what is driving up the cost” of corrections. “Within the state of Maryland, the number of incarcerated inmates has decreased from 23,900 in 2003, to 21,000 in 2013,” Dumais said. The cost of corrections in Maryland has risen dramatically in the last 10 years, said Dumais. McDonough was not convinced, nor was he ready to advocate for a council that studied offenders more than victims. McDonough proposed two types of criminal, the “saveables” versus the “predators.” He would prefer bills make a distinction between the level of criminal an ex-offender is, before they receive assistance from the state. “Saveables; These are first, second time offenders, these are young people who want to do their time in prison get out and go home,” said McDonough. Drug dealers, child abusers and rapists fall into the category “predators,” according to McDonough. McDonough had similar concerns with another bill on the House floor Thursday morning. HB 909, which would create a pilot program to aid ex-offenders in the development of a small business. The program would operate off of private funds raised by the Meridian Management Group, who have been working with the Economic Matters Committee throughout the creation of the bill. Del. Dereck Davis, Economic Matters Committee chairman, says the corporation has found private investors who are interested in contributing $95,000 to the program. As the bill stands now, however, there is no provision to protect the state from contributing funds to cover additional costs. However, Davis argued after having served their sentence and completed parole, they will need assistance to transition safely back into society. “If we’re releasing them back into society with no opportunity of employment…What do you think is going to happen if that’s the case?” asked Davis. McDonough likes the idea of assisting some offenders, just not the predators. However, legislators like Davis and Dumais believe differentiating between levels of criminal in one bill would not be plausible. “I do wish life was as simple as my colleague makes it, if things were as black and white…then we wouldn’t have to spend ninety days here, but it is not,” said Dumais.